Earlier in March I visited Eritrea and its World Heritage capital Asmara. Architects frequently describe it as Africa’s secret modernist city, but futurism, rationalism and assorted other architectural buzzwords have also been applied. It’s all a result of its period as an Italian colony, a time when Mussolin described Asmara as La Piccola Roma, Little Rome. ▲ Italian cinemas were part of that architectural heritage although sadly they’re little used today. I was astonished when I dropped in to the Impero Cinema on the city’s main street, Harnet Ave and found there was a film showing. 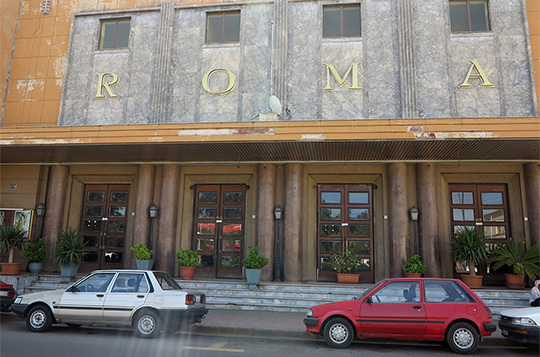 ▲ You certainly wouldn’t find anything showing in the boarded up Roma Cinema on Sematat Ave. You could glimpse the magnificent bar and café through the grubby windows, but there was no way you were going to front the bar for a cappuccino or a chilled Asmara Beer. ▲ Fortunately along with lots of dismal and dark hideaways there were still a few bars with some real old fashioned style, like Bar Crispi close to the British Embassy. 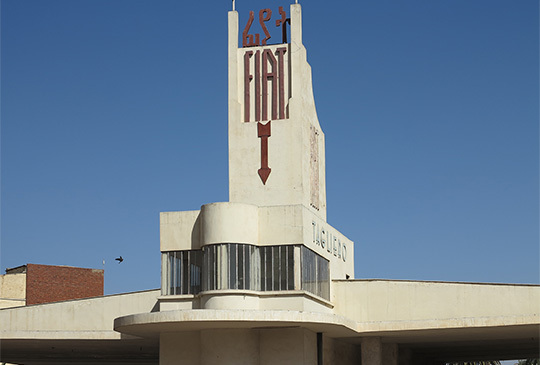 ▲ The Fiat Tagliero building is probably the city’s iconic piece of architecture, the once-upon-a-time service station built in 1938 to resemble a concrete airplane features wings that stretch out for 15 metres on each side of the ‘fuselage’ and are entirely unsupported. ◄ Alfa Romeo also makes an appearance in this ruined and decaying office building. 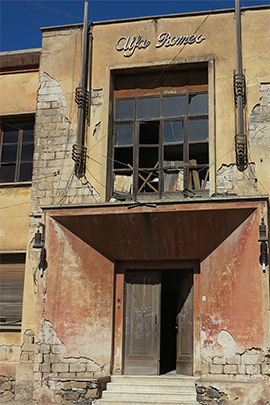 In fact a lot of Asmara’s fine architecture is abandoned and decaying, but unlike Yangon in Myanmar or Havana in Cuba the buildings don’t face imminent ruin. There’s no tropical heat and humidity to rapidly wreck things. ▲ And the cheerily bright Sun Rise Café on Adi Hawesha St. 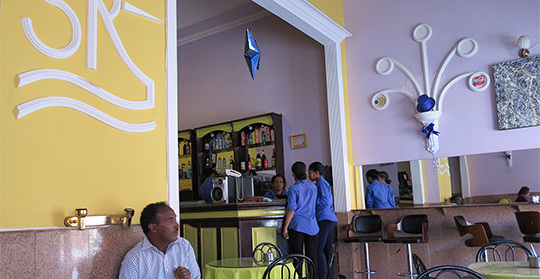 I stayed in the unrelated Sunshine Hotel which was squeaky clean and, unlike so much of Asmara, busy and bright. 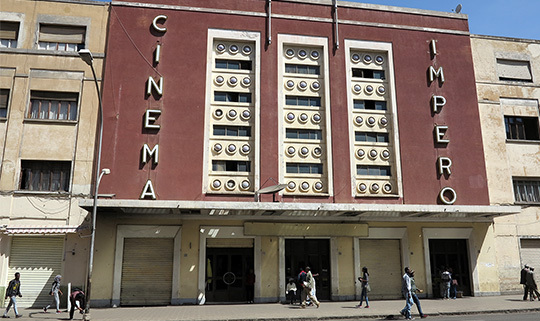 Sadly despite the architectural interest Asmara often felt semi-abandoned and far too quiet. It’s an indicator of how many people have fled the country’s repressive government, making Eritreans one of Europe’s biggest refugee problems even though the country is not at war, there’s no famine, no natural disaster to drive people out. Just bad government. 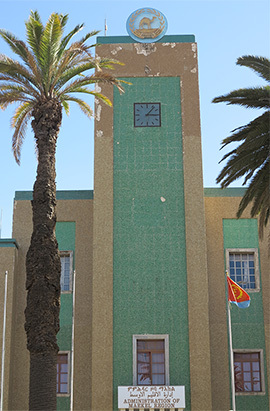 ◄ The Municipality Building is one of the more modern structures, dating from the early 1950s. 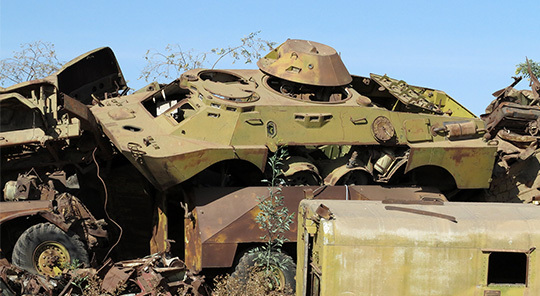 ▲ On the outskirts of town the Tank Graveyard is a reminder of the bitter independence war which finally separated Eritrea from Ethiopia. 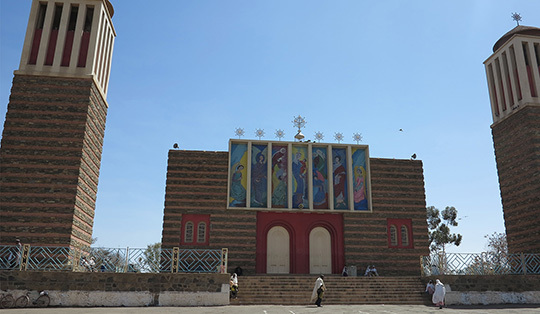 The war never actually reached Asmara so the city’s architectural heritage was not damaged. Haile Mariam Mengistu, leader of the Derg, was bundled out of power in 1991 and scuttled off to Zimbabwe where Robert Mugabe looked after him. With the fall of Mugabe in 2017 it’s again speculated that he might be extradited to Ethiopia.